100% fairly traded and grown in Tahiti under organic conditions. Non-GMO. Gluten-free. Approximately 70 beans per pound. 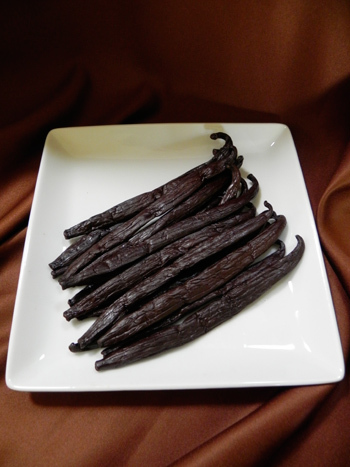 Tahitian vanilla beans are generally shorter and plumper, and have a higher moisture content than planifolia beans. They have a thinner skin and fewer seeds than planifolia beans and are less shiny. Tahitian vanilla has a fruity, floral aroma with notes of licorice, cherry, prunes and redolent of fresh fruit as you would find in Viognier or Reisling wine. True Tahitian beans are perfect to use in any cream desserts such as Creme Brulee, vanilla pastry cream, or custards. They are ideal in any fruit desserts, baked or fresh. Tahitians use them in seafood dishes — for instance, Mahi Mahi in a vanilla cream sauce, or Seafood in a Coconut Milk and Rum Sauce. The unique flavor of Tahitian vanilla can make for a stunning presentation in vanilla sugar cookies and delicate vanilla cakes. 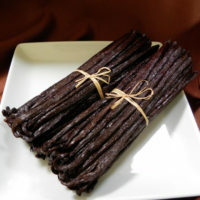 True Tahitian vanilla beans are grown in Tahiti. You will find less expensive vanilla beans labeled as Tahitian that are not true Tahitian beans, but are Vanilla tahitensis beans, usually grown in Papua New Guinea. These beans will have a similar fruity and floral flavor and fragrance profile, but will not be as plump and moist, and not quite as flavorful as true Tahitian beans. There are approximately 70 beans per pound. Average length is approximately 6″ (15-16cm).